LOOKING for somewhere new to eat in New Norfolk this winter? Get your nostrils twitching as the smell of authentic Italian cuisine mixes with the earthy and woody smells of the Oast House at New Norfolk. Local residents Chrissie and Marino Maciocco of Love Our Valley Enterprises will host a series of Pop Up Pasta Nights at the historic Tynwald Park venue in early July, August and September. 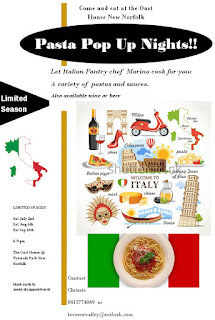 Marino is an award-winning chef who creates authentic and rustic Italian meals, and loves to see and hear people enjoying the dishes he has created. DATES: Saturday July 2, August 6 and September 10.